WWW.WAFFEN-SS.NO "SWEDEN: VOLUNTEERS OF THE WAFFEN-SS"
11th SS-Freiwilligen Panzergrenadier Division "Nordland"
Unlike Spain, Sweden was strictly neutral during World War 2, and did not allow the belligerent powers to recruit from amongst its population. However, the government did allow some 10,000 men to fight for Finland against the USSR during the Winter War, and when Germany launched Operation Barbarossa, the Swedes allowed Finland to recruit a further 1500 volunteers. A few individuals are known to have joined the Wehrmacht between 1939 and 1941. After the invasion of Russia, the Waffen-SS began a clandestine recruitment programme, working through the German Embassy in Stockholm and funnelling any such volunteers through Norway. There are several estimates of the number of Swedes who fought for the Germans, ranging from 150 to 330. Swedes are known to have served with the 5th SS-Panzer Division Wiking, the 11th SS­Freiwilligen Panzer grenadier Division Nordland, and the 23rd SS-Freiwilligen Panzer grenadier Division Nederland. It is known that 11 Swedish SS men went through the SS Officer School at Bad Tölz. Several Swedes worked as SS war correspondents. One unit, the 3rd Company of Nordlands Armoured Reconnaissance Battalion, had a large proportion of Swedes; so many that the 4th Zug (platoon) of the company was known unofficially as the Swedenzug. The Swedenzug, along with the other Swedes in the Nordland Division, were among Hitler's last defenders in the Battle of Berlin. After seeing action in the Baltic and Courland late in 1944, it was withdrawn to the Oder front early in 1945. It was practically wiped out in an attempt to break out of Berlin on 2nd May 1945. History:- Rune Ahlgren left the the officer academy of the Swedish Army (Karlberg) to join the Waffen-SS. He served as a platoon leader in the 2./SS-Pz.-Aufkl.-Abt. 11. He was killed on the 30 October 1944 near Preekuln in Latvia when he tried to save one of his wounded men, during the second battle of Courland. Rune Ahlgren was one of the few Swedish officers to join the Waffen-SS. His name is not on the memorial plates in Karlberg that lists all former students that had been killed in the line of duty. Ex-students that were killed in Finland during the "Winter War" are listed . During the 1980's some voices demanded that Rune Ahlgren's name should be placed on the list. This created a rather large debate about the issue, but in the end Rune Ahlgren name is still not listed on the memorial. History:- Sven Alm served at first with the 5. SS-Panzer-Divsion "Wiking", but was later transferred to 3./SS-Pz.-Aufkl.-Abt. 11. He may have have served as a volunteer in Finland. He was with Ledin and omberg during their escape to Sweden. History: Bodin went to Norway in order to join the Waffen-SS. At the end of the war, bodin was working for the Gestapo in Oslo. When Germany surrendered, bodin and another Swede tried to steal a car in order to go to Sweden, but the owner of the car saw them and "fire fight" broke out in which the car owner was shot down and Bodin's friend was wounded. Bodin then fled and left his friend behind. History:- Before the war Gosta Borg was the leader of one of the smallest Swedish National Socialist parties. He volunteered for the Waffen-SS in 1941 and served in the Regiment "Westland", 5. SS-Panzer-Division "Wiking". While he was with Regiment "Westland" he was wounded and returned to Sweden. Back in Sweden he went to the Swedish Army officer's training school(this was probably in 1942). he once again joined the Waffen-SS, this time as an SS-Kriegsberichter. In this position he served at the Narva front. He was promoted to SS-Untersturmführer in 1944. In 1951 he published a book called "Det röda massanfallet", that is "The Great Red Asssault" where he describes his experiences from the eastern front and his ideas about how Sweden should the the Soviet threat during the "Cold War". History: He joined the Waffen-SS in the spring of 1941. He fought on the eastern front at the River Dnjepr, summer 1941. Cederholm returned to Sweden in late 1941 and was sent to a mental hospital from which he later escaped from and re-joined the Waffen-SS! History: Wolfgang Eldh-Albiez was an expatriate from Hamburg. He did his national service as a Svea Lifguard of the Swedish Army in 1941. He graduated from the SS-Junkerschule "Tölz" at the top of his class spring 1944. He then served with the SS-Panzer-Ersatz Regiment that later would become SS-Panzer-Brigade "Gross". He was badly wounded outside of Riga in the summer of 1944Eldh-Albiez returned to Sweden in 1945 after having spent the rest of the war in hospitals at Hamburg and Pomerania. He died in 1984. Born:- 22 December 1922 in Ragunda, Sweden. History:- He left Sweden for Germany in August 1941 and joined the Waffen-SS on 20 August 1941. After completing basic training he was assigned to the 5. SS-Panzer-Division "Wiking". In 1943 he was sent to SS-Junkerschule "Tölz" and graduated with the rank of SS-Untersturmführer on 1 September 1943. Afterwards he was posted to the III. SS-Pz-Korps (germanische). Then on 20 May 1944 he went into the SS-Panzer-Aufkl.-Abt. 11 of the 11. Freiwilligen-Panzergrenadier-Division "Nordland", where many Swedish volunteers were grouped. He was wounded in action while serving with this unit on 18 July 1944. apparently the Swedish Recce party was caught in an ambush near Kunighisky in Lithuania and its' SPW was hit by anti-tank fire and its' driver SS-Rottenführer Karl-erik Persson was killed. Eklöf was subsequently awarded the Iron Cross 2nd Class and after recovering from his wounding was posted to the SS-Hauptamt in Berlin where he served as liaison officer to the Swedish SS volunteers. During his stint in Berlin he shot and killed fellow Swedish SS comrade Sven Rydén in an argument over a woman. For this crime he was imprisoned, but shortly released to serve in SS-Jagdverband "Nordwest" for the last months of the war. Born:15 December 1910 in Uppsala, Sweden. History: At first he served with SS-Regiment "Westland"; 5. SS-Panzer-Division "Wiking" He had then gone to SS-Junkerschule "Bad Tölz" and was awaiting his promotion to SS-Untersturmführer when he was killed outside of Warsaw (Warschau) on 20 July 1944, when his SPW(armoured personnal carrier)was hit by machine-gun fire. At the time of his death he was serving as a platoon commander in 9. (SPW)/SS-Regiment "Germania". History:- Lars Forssberg was decorated for his service with the Swedish volunteer corps in Finland during the "Winter War". In the Waffen-SS he served with the 1./SS-Regiment "Westland" in the 5. SS-Panzer- Division "Wiking". He was mortally wounded on the 23 March 1942 and died from his wounds on the 30 March 1942. His unit was at this time stationed around the river Mius in sorthern Russia. Some sources indicates that he may have been promoted to SS-Rottenführer. History:- In Sweden he served as a Corporal with the Jämtlands Fältjägerregiment I 5 (fifth infantry regiment) in Östersund. He was a member of the SSS and the leader of the Nodric Youth. Per served in in Finland during the "Winter War". He also served in the 6./ SS-Regiment "Germania" in the same squad as Nisseby and Sjögård. He was killed at the Beresina Front. To honour him there was a great memorial ceremony in Stockholm on the 6 November 1943 arranged by the SSS. History: Ulf was responsible for the recruiting of Swedish volunteers at the Finnish border. He later volunteered himself and reached the rank of SS-Haupsturmführer. After the war, Hamilton served as an instructor for the voluntary training organisation responsible for conscripted officers and NCO's in the Swedish Army (FBU). He committed suicide in the 1950's or 1960's because of economical hardships. History:- He was a member of the SS-Ausbildung und Ersatz Btl. 5 in Klagenfurt, Austria.Reported as missing during an anti-partisan operation in Jugoslavia in September 1943, probably with the 11. SS-Freiwilligen-Panzer-Division "Nordland" in Croatia. History:-Hans-Casper Kreuger was a Swedish officer cadet who volunteered fot the Swedish battalions went to the aid of Finland during it's "Winter War" with the Soviet Union. the Swedes got as far as Hango, Finland but never actually saw any action.Upon their return home in early 1941 they were honoured by a parade march before the King in Stockholm. Once Germany and the USSR went to war, many of these same Swedes, including Kreuger, went to Oslo to volunteer their services to the Waffen-SS. Kreuger was accepted and sent to the SS-Junkerschule Tölz for officer's training. He subsequently saw substantial combat action with the 5. SS-Panzer-Division "Wking", the Estonian SS-Freiwilligen Btl. "Narwa" and the 11. SS-Freiwilligen-Panzer-Division "Nordland" before being assigned as a war correspondent from the SS-Kriegsberichter Standarte "Kurt Eggers" to the SS-Pz.-Rgt. 5/ 5. SS-Panzer-Division "Wiking". He was with this unit during the difficult fight to escape from the "Cherkassy Pocket", where he laid fir boughs (in lieu of flowers) on the graves of the Swedish volunteers who died there and immortalised their deeds in a dispatch that was widely published newspapers throughout Europe. A great believer in the Pan-European war against Bolshevism carried on by the Waffen-SS, Kreuger's articles and writings frequently appeared in the Scandinavian press. After having participated in nearly all of the "Wiking" Division's combat missions, SS-Ostuf. Kreuger took on one last assignment — perhaps his greatest of all — in April 1945 when he joined the French Assault Btl. "Charlemagne" during its' heroic struggle in the battle for Berlin. Kreuger survived the fighting, and with the help of a U.S. Army Captain was able to leave captivity and immigrate to Argentina where he began a new life with four Scandinavian Waffen-SS comrades. He later returned frequently to Europe to attend Waffen-SS veteran's reunions. A veteran of some of the most savage fighting on the eastern front , Hans-Casper Kreuger died in a tragic automobile accident at an un-monitored railroad crossing in Buenos Aires on the 15 November 1977. History:Ledin was one of the first Swedes who volunteered for the Waffen-SS. At first he served in with the 5. SS-Panzer-Division "Wiking"as a machine-gunner (MG-1). Later he was transferred to the 3./SS-Panzer-Aufkl.Abt. 11. During the retreat from Estonia in August 1944, Markus Ledin together with his comrades Sven Alm and Ingemar Somberg were cut off behind enemy lines when their SPW developed engine trouble. They camouflage the vehicle and then started to repair the SPW. After three nights behind the Soviet lines they reached the Estonian coast near Haspaal. They had reache da small fishing village where they saw sixteen Soviet soldiers plundering and murdering the local inhabitants. The Swedes manage to surprise them and put them out of action. After the attack, some of the Estonian survivors began killing the wounded Soviet soldiers as revenge for their misdeeds. These Estonians then escaped with the Swedish Waffen-SS soldiers, in fishing boats to Finland. When they had reached the Finnish coast, they were arrested by the Finnish Army and handed over to the Soviet authorities (this was after Finland negotiated a peace agreement the Soviet Union). Ledin and Alm had served in the Swedish volunteer corps during the "Winter War" in Finland and showed their medals to Finnish commander, who said they were "good boys" and released them, so they could continue back to Sweden. Born:- 10 September 1910 in Stockholm, Sweden. Fate:- K.I.A. 29 December 1941. History:-Hans Lindén was a member of the Nordisk Ungdom(Nordic Youth), the youth organisation of the SSS, the largest Swedish Nationalist Socialist Party. He had served as a volunteer in Finland during the "Winter War". He was killed at Stalino by the river Mius in December 1941 when he served with the 5./ SS-Flak-Abt.5, 5. SS-Panzer-Division "Wiking". He was the first Swedish Waffen-SS member to be killed in action. After his death his name was given to a battlegroup Kampavdelning Hans Lindén, an organisation for the Swedish volunteers within the Waffen-SS. Some sources say he was promoted to an SS-Rottenführer. History:- Meyer's father was a professor at the University of Stockholm, volunteered for the Waffen-SS at the age of eighteen in 1941. He was not an organised Nationalist Socialist like other Swedish volunteers, but he wanted to fight against the the Soviet Union. He was badly wounded when serving as SS-Schütze in 9./SS-Regiment "Germania" in the 5. SS-PAnzer-Division "Wiking" during 1942. After having recovered from his wounds, he was assigned to SS-Junkerschule "Tölz" and went through the 11. Kriegsjunker Lehrgang together with several other Swedes. After grauating he was assigned to 3./SS-Panzer-Aufkl.Abt. 11 a platoon commander. In Estonia he was once again badly wounded and by mistake reported as K.I.A., but after having recovered he was able to return to his company. Once again wounded at Vossberg on 3 March 1945 he was not able to return for duty again. He returned to Sweden in 1945, then emmigrated to Spain shortly afterwards. One of friends said about Heino: "Heino was the youngest officer in the battalion". A very popular lad. One of the best platoon commanders in Kurland and Pommerania. It's a miracle that he survived his last wound. A shell splinter in his neck, a shot to his shoulder and his leg full of shell splinters. Born: 17 August 1918 in Haparanda. History: He was a Sergeant at Luleå Luftvärnkår. LV 7 (Luleå anti-aircraft corps)) in Luleå (northern Sweden) before joining Waffen-SS. At first he served with the 5. SS-Panzer-division "Wiking", but was later transferred to 3./SS-Panzer-Aufkl.Abt. 11 where he served as commander of the 4th platoon of the company. He was killed in action on the 25 January 1944 at Rogowitzky during the retreat from Oranienbaum. Born:9 February 1920 in Jämtland, Sweden. History:-He was a Corporal at Jämtlands fältjägerregimente, I5 (fifth infantry regiment) in Östersund. He was a member of the Nordisk Ungdom (Nordic Youth) and the SSS (Sven Socialistisk Samling). He joined the Swedish volunteer corps in Finland during the "Winter War". He was bck in Finland in 1941 with the Swedish volunteer battalion at Hangö front. When th battalion was dissolved in late 1941 he joined the Waffen-SS. He was killed at the Beresina front on 23 July 1943 while serving with the 6./SS-Regiment "Germania", 5. SS-Panzer-Division "Wiking". History:- Nystrand was a director in Helsingborg (south Sweden). He served in the Waffen-SS 1942-1943. After the war he helped German war criminals with accommodation and food. He also supplied them with false documents, so that they could escape from Europe. History: He was a greve(Count). He joined the Swedish Volunteer Company in Finland when he was only seventeen, as a private in its' Ranger platoon. He was with the company when it faced the great Soviet summer offensive in 1944. When the company was dissolved in the autumn of 1944, Knut Posse joined the Waffen-SS in December 1944. He was placed in the SS=PZ.-Gren.-Ausbild.-u. Ers. Btl.18 for training. Serving with the "Wiking" division, he was reported as M-I-A, probably killed on 22 April 1945 at the Brenner Pass, on the borders of Austria and Italy, after his unit had been fighting advancing American forces up from Italy. History:- He was serving with the 5. SS-Panzer-Division "Wiking" when he was K.I.A., in the Kaukasus autumn 1942. History: From 1944 Sven-Erik Olsson served as a personal signaler for Heinz Harmel, commander of the 10. SS-Panzer-division "Frundsberg". He was awarded with both classes of the Iron Cross. Some sources indicate that he also was awarded the German Cross in Gold. Sven-Erik Olsson died in 1985. Born:- 10 October 1910 in Karlskrona (a town in the southern part of Sweden). Fate:- He died in 1974, in Stockholm, Sweden. Promotions:- SS-Obersturmführer – 21 June 1944. When Germany attacked the Soviet Union in 1941, Pehrsson was working at a chemical company in Copenhagen. He volunteered for the Waffen-SS in September 1941. At first, he served in the Danish volunteer unit "Freikorps Danmark". After heavy fighting at Leningrad and by Lake Ilmen, (south of Novgorod) 1941 - 1942, Pehrsson was promoted to NCO and became a commander of a machine-gun platoon. He went on to the Waffen-SS officers' school, SS-Junkerschule "Bad Tölz" in late 1942 and graduated in spring 1943. As an SS-Untersturmführer, he was asssigned to the newly created SS-Panzer-Grenadier-Division "Nordland". At first, he was a platoon commander in the 3./SS-Pz.-Aufkl.-Abt. 11, the third company of the of the SS-Panzer-Aufkärungs-Abteilung 11, but when the German company commander was killed in April 1944, he took charge of the company. During 1944, he led the "Swedish company" during the charge of the company during the heavy fighting in the Baltic States — Dorpat, Riga, Dünaburg and Preekuln. On the 27th of October 1944, the company was almost wiped out in the fighting around Preekuln. Pehrsson had been order to take an important hill near the village of Trekni. The assault was sucessfull, but when the hill and its' Russian bunkers were seized, the company was down to twenty-five men. The Soviets assault the hill time after time in order to take it back. The attacks were repelled for four days; on the fifth day the Swedes were forced to retreat. Pehrsson's HQ bunker was only a hundred metres behind the front line; when saw that front line had been breached, he managed to gather his unit and counter-attacked with only twelve men. The Soviets were surprised by this sudden attack and retreated. Pehrsson and his men were able to take more than a hundred prisoners that day. After this incident, Pehrsson was awarded the Ehrenblattsspange des Heeres (Honour Roll Clasp of the Army). Pehrsson led his company through the retreat from Courland, Stettin (in the German province of Pomerania) and on to the final battle in Berlin. In April 1945, he became deputy commander and Ic (intelligence) section of "Nordland"s' headquarters staff. By now he had reached the rank of SS-Hauptsturmführer. The war was about to end and SS-Brigadeführer Generalmajor der Waffen-SS Joachim Ziegler, the divisional commander of "Nordland" didn't like the idea of sacrificing his men for a lost cause. He started to investigate ways of how to get the SS volunteers out of Berlin and away from the attacking Red Army. Pehrsson helped Ziegler in this task. He managed to get a so-called "Wehrwolfpass"; this pas gave the holder many advantages over all German citizens. He tried to contact the Swedish Legation in order to help his fellow country-men in the service of the Germans; he had no success. Because of these activities he was accused of insubordination and arrested. For some reason he was released after a few days , and could once again take charge of his old company. On the 27th April, the remnants of the company was subordinated to the Reichschancellery. The situation was very hopeless. On the first of May 1945, Pehrsson gathered his men for an escape attempt over the Wedendammer Brücke. Pehrsson said good-bye to the remaining survivors with these parting words: "The war is over, save yourselves". The escape attempt took place the night between the first and second of May. Soon after the start, the unit came under heavy Soviet fire and Pehrsson's vehicle came under; his driver SS-Unterscharführer Ragnar Johansson was killed instantly and Pehrsson himself was wounded. He managed to get away from the Soviet forces and took cover in a apartment building. He hid himself in a closet for two days. Then when he got out; he met a women who promised to help him, by getting him some clothes. But when she returned, Russian soldiers were accompanied her. Fortunately, Pehrsson had time to get rid of his Waffen-SS uniform jacket and changed into a Wehrmacht one. He was then sent to a Russian prison camp, from which he managed to escape from; early on after his capture. He somehow, was able to get civilian clothes and hid himself in an apartment in Berlin. After a while, he meet up with his old SS-Unterscharführer Erik Wallin, together they walked to the British Occupation Zone and from there they were able to back to Sweden. During his service with the Waffen-SS Hans-Gösta Pehrsson was wounded five times! After the war Hans-Gösta Pehrsson worked as a salesman in Stockholm, Sweden. Born:- 5 February 1897 in Stockholm, Sweden. After finishing school, Sven seems to have served on active duty in the Swedish Army from 1918 – 1920. Following that he worked as a salesman until 1939 but remained active in the military reserves (Landstorm). From 1939 to 1941 he took military instructional courses in Sweden and with the rank of 1st. Lt. served in a Flak unit, that may also have been a reserve formation. Also in 1941 he was serving at the Swedish Armed Forces Headquarters in Stockholm. Apparently after the German-Soviet Union war broke out, Ryden decided to go to Germany to offer his services. On 24 August 1941 he was able to volunteer for service in the Waffen-SS in northern Finland. He was possibly first sent to the Germanic SS training Camp at Sennheim, Alsace, (another Swedish volunteer stated that he had served there but in a command position). From 20 October 1941 until 11 May 1942, SS-Ostuf. Ryden served with the SS Flak Ausbildung u. Ersatz Abt. On 11 May he was sent to the SS-Hauptamt in Berlin. Indications are that he now served in a variety of jobs. Sometime in 1943 he was assigned to the RSHA, Amt VI B - Scandinavian section. He seems to have been active in trying to recruit Swedish and Estonian-Swedish volunteers for the "Narwa" battalion of the Waffen-SS. British intelligence also indicated that he made radio broadcasts concerning developements in the Baltic States and the military situation on that area of the eastern front at the behest of the propaganda section of the SS-Hauptamt. He is also said to have been assigned to an SS office in Estonia. In 1944 he was again assigned to the RSHA, this time to Amt III B - VOLKSTUM (Nationality). According to Sven Rydén, he resigned from the Waffen-SS in the autumn 1944 because being passed over for promotion. At no time, did he ever do front line service. On 19 February 1945 Ryden was found dead in his apartment at Nordlingerstraase 3 in Berlin. Another Swedish SS man, Gunnar Eklöf had apparently become his bitter enemy over a woman, and had finished him off by shooting him in the back. As near as one can ascertained, Ryden was one of the oldest Swedish volunteers in the Waffen-SS. K.I.A. on the Beresina Front on April 1943. He served with the 6./SS-Regiment "Germania", 5. SS-PAnzer-Division "Wiking". He was a member of the SSS. One source says that he was K.I.A. on the 21 July 1943. Born:- 23 April 1922 in Eksjö. He was serving with the 5. SS-Panzer-Division "Wking" during the Cherkassy break-out. History:- As a captain in the Swedish Army, he was the last Swede to joine the Waffen-SS in January 1945. He was to serve with the 1./ "Norge"Regiment in the 11. 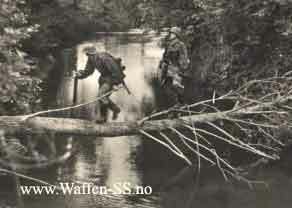 SS-Freiwillegen-Panzergrenadier-Divsion "Nordland". Born:- 19 November 1917 in Skillersta, Sweden. Fate:- KIA on 26 June 1944. History:- Tillman served as an NCO in the signal corps of the Swedish Army from 1 April 1938 until 30 March 1942. The day after he resigned from his post, he became a German citizen, but still kept his Swedish citizenship. With his mother being German, Torkel had lived in Germany for many years. On 1 June 1942 Tillman enlisted in the Waffen-SS and was sent to the Germanic SS Training Camp at Sennheim, Alsace. He attended an officer's training course at SS-Junkerschule "Tölz" from 6 September 1943 — 11 March 1944.Afterwards he was assigned to the 11. Oberjunker Training course of the Signals School of the Waffen-SS but on the 9 April 1944 he was transferred to the SS-Kriegsberichter Standarte "Kurt Eggers" [War Correspondents] (Note: possibly due to the fact he was very fluent in two languages: German and English). He was then posted to the 12th SS-Panzer-Division "Hitlerjugend". It was while he was serving with that unit he was promoted to SS-Untersturmführer came through on 21 June 1944. S-Ustuf. Tillman was K.I.A. on 26 June 1944 during the "Hitlerjugend" Division's defence of Normandy against the Allies. Born: 2 August 1921 in Stockholm. History:- He was apparently a career soldier, serving in both the Swedish and Finnish armies between 1936 and 1943. Specifically he served in the Finnish Army during the Winter War of 1939 - 1940, and again from August 1941 until April 1942. He evidently served in Finland as a Sergeant , with the permission of the Swedish Army. It would appear that Westrin went AWOL from his Finnsih unit in 1942. After being apprehended he was jailed and courtmartialed. He was first sentenced to three months imprisonment but this was reduced to an 18 day sentence of only bread and water. After being released he deserted permanently and was "dismissed" from the roster of his Finnish unit. Westrinthen went back to the Swedish Army, "officially" serving from 18 April 1942 to 13 May 1943. However on the 14th April 1942, Westrin left Sweden for Norway and on 18th April he enlisted in the Waffen-SS in Oslo, stating that he wanted "to live the soldier's life above all else". the Swedish Army listed him as AWOL on 13th May 1943. Westrin was accepted into the Waffen-SS with the rank od SS-Unterscharführer and evidently served first with the 5th SS-Panzer-Division "Wiking" and then in the 11th SS-Panzergrenadier-Division "Nordland". At some point in time he was sent to an NCO training class in Latvia after which he became an SS-Oberscharführer. He was then assigned to the SS-Panzer Reconnaissance Training and Replacement Detachment stationed in Riga-Strand training Camp, Latvia, where he served with the "stamm" company, which was the cadre formation for the unit. On 17th May 1944, while serving at Riga-Strand, Westrin applied to the SS Race and Resettlement Branch Office in Oslo for permission to marry a Lolo Eckhoff. Soon afterwards, SS-Oberscharführer Westrin's training unit was mobilised as part of the "ad hoc" SS-Panzer-Brigade "Gross". which was sent to the defence of eastern Latvia. Westrin was apparently killed with his whole squad of five men by a landmine on the 18th September 1944 near Saukenai, Lithuania. Other sources state that he also died on the 8 September 1944 and the 5 October 1944. History: Wikström at first served with the SS-Regiment "Germania" in the ""Wiking" division. He then later was transferred to the 3./SS-Pz.-Aufkl. Abt. 11 on 26 January 1944.